Ugh, guys, I've been eating a lot of fried chicken & gnocchi lately. This isn't necessarily a bad thing (it's actually all been quite delicious), but - the point of this blog was to make my FRIENDS fat. So, I decided to come up with a recipe that was going to satisfy my tastebuds AND improve my biceps. Fish was the answer. 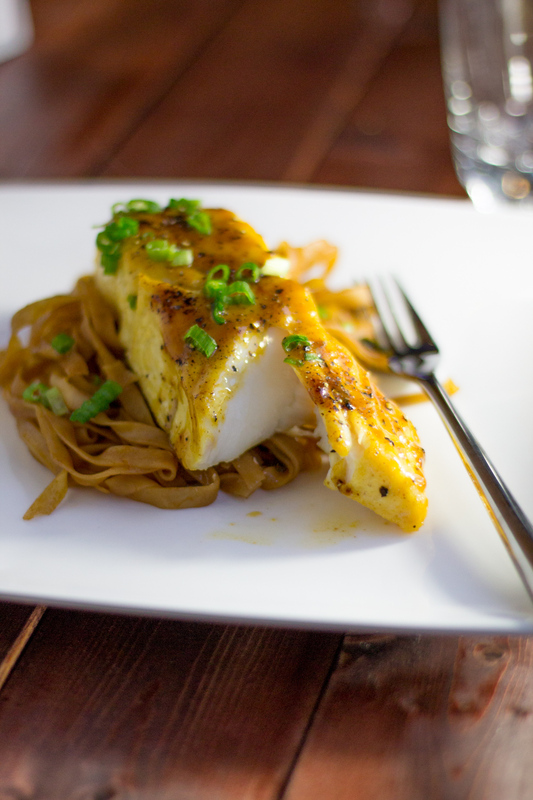 Halibut, the chicken of the sea. This mild, lean fish lend its self well to flavour. Enter citrus: the bold, sweet tang we love. These two go really well together and manage to produce a healthy dinner that's high in ... TASTE. This recipe starts out, perhaps predictably, with halibut. A quick marinade (~30 minutes) in maple syrup, orange juice concentrate, coriander, jalapeños and garlic sets this fish up for success. Placed on a baking sheet, a bit of brown sugar dusted on top will help develop a sticky glaze. Broiling the fish (versus baking) will also help develop a caramelized glaze but be warned: you have got to keep a watchful eye. It can burn easily with the high temperature of your broiler. Layer after layer we build up that glaze using our original marinade that was reduced to a oooey gooey dream on the stove top. For me personally, this was getting a bit too healthy. Some carbohydrates were warranted (necessary). You of course can choose any side you wish. Steamed broccoli. Fried chicken. Whatever you'd like. And then, in less than 45 minutes of total cook and prep time dinner is up. This dish is a bit of a stunner, taste and appearance wise. The orange glaze contrasts with the beautiful white of the halibut. The flavour is equally stunning. Sweet and savoury and caramelized and ... sticky. All great things. The sauce is really great, I (of course) added even more after the fish was out of the oven. I ALSO served some on the side to dunk the fish in. If you're also a sauce-o-holic I'd recommend the same. We're on Part 2 of what I foresee as being a continuing series here on Bake, Braise & Broil (see Part 1 here!). I love mussels. They're cheap, they're sustainable and they're delicious. I think a lot of people are turned off cooking mussels because of inexperience and the 'intimidation' factor. Fret not, we're in this together and I think you're going to be surprised at how easy they really are. For those who live near an ocean, I'm jealous. For the rest of us, Costco (yup!) brings in fresh farmed mussels and they are pretty stellar. And cheap. You get 8 pounds of these tasty morsels for under twenty bucks! This version nestles mussels in a tasty, zingy tomato and garlic broth. Sweetness comes from caramelizing onions and red pepper flakes bring a touch of heat. Cooked with the mussels you get a delicious tomato-garlic-seafood stew. Salty, briny and sweet. And it's dead simple. Once you've got your base, your whole meal comes together in 5 minutes. If you're strapped for time, this is an amazing weeknight meal. Make the broth on the weekend (or whenever you have time). Reheat and then cook your mussels and you have dinner in 10 minutes. Absolutely necessary for this recipe is some toasted bread. That delicious broth your making? It is even better when you sop it up with some fresh bread. So, while your cooking the mussels, throw some bread brushed with olive oil under the broiler. The mussels cook quickly once they're added to the boiling broth - be careful not to overcook them. They will only need 3-4 minutes to cook. Once they've opened they are done, take them off the heat. To serve, I take the mussels and place them on a platter. I divide the broth in half, pouring half directly over the mussels. The other half, I divide among ramekins so everyone can coat each and every mussel in delicious sauce. The "dunk factor". It's also perfect for dipping bread into.